Publication consisting of two volumes. 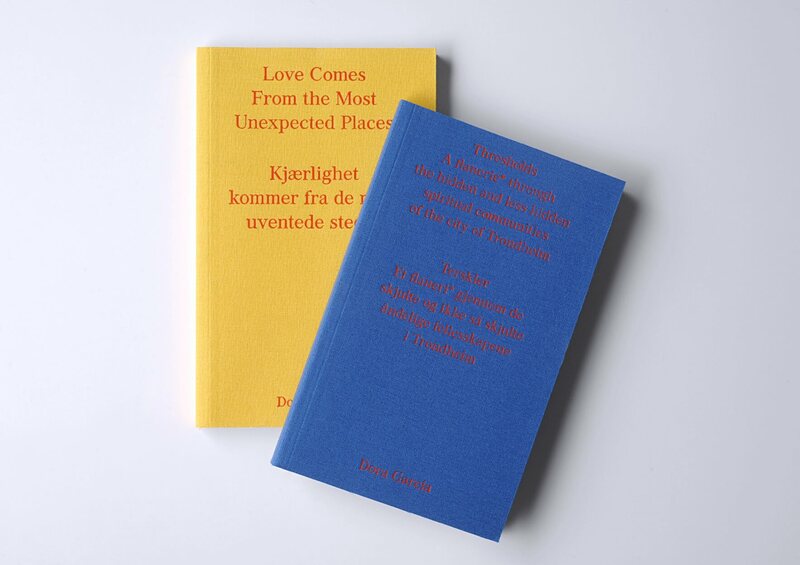 Published on the occasion of García’s exhibition Loves comes from the most unexpected places, held at the Trondheim Kunstmuseum from May to September 2018. The “yellow” book reviews some of the works by García shown. The “blue” book is a “strolling” guide inviting the public to take a walk to the Beyond side. An architectural/urban/tourist guide to the doors of the buildings, private or public, where a community meets for spiritual purposes in the city of Trondheim. Spiritual communities represented by a number of churches, chapels, gathering places, cultural and religious associations, inextricably linked with the social fabric, the cultural evolution and the history of Trondheim.